The annual income – derived from public donations in the U.S. and Europe – to ‘conservation charities’, (as the animal rightist NGOs like the public to call them) – runs into hundreds of millions of US dollars. A great deal of this money is raised to fund the so-called ‘saving’ of charismatic wild animals in Africa. Fabricated and highly emotional stories about elephants, rhinos and lions have far greater appeal to uninformed people in the West than the more common animals in their own back yards! Organisations like IFAW (the International Fund for Animal Welfare – which is really an animal ‘rights’ organisation); HSUS (The Humane Society of the United State); HSI (Humane Society International) and the Born Free Foundation, all have annual incomes in excess of US$ 100 million; several above US$ 200 million; and one infinitely greater. PETA (People for the Ethical Treatment of Animals) are said, last year, to have raised ‘only’ US$ 80 million. None of this money – or very little of it – is ever returned to Africa to ‘solve the problems’ for which the money was raised. Most of it gets paid into the bank accounts of the NGOs involved – to maintain senior staff salaries and their lavish life-styles. During the three years prior to CITES CoP 17 – the seventeenth Conference of the Parties held in Johannesburg South Africa in 2016 (of the Convention on International Trade in Endangered Species), the top probably 100 Animal Rights Groups throughout the Western world, broadcast – month after month; year after year – volumes of propaganda material stating that the African elephant was facing extinction. And they appealed to the public for funds to ‘save’ this iconic animal. The first thing we have to say about this animal rightists’ fund-raising campaign is that the propaganda story it put out (about the elephants facing extinction) was/is a lie. There is, therefore, nothing wholesome or civilised about propaganda. How can I be sure this story – about the elephant facing extinction – is a lie? Because, I have been working with and/or managing wild elephant populations in African national parks all my life; because, more specifically, for over five years I lived with and managed the elephants of the Gonarezhou National Park in Zimbabwe; for five years I lived with and managed the elephant populations of Zimbabwe’s Binga District; and for another five years I lived with and managed the elephants of Hwange National Park in Zimbabwe. And among many other similarly prestigious postings, I was the Provincial Game Warden-in-charge of Hwange National Park, one of Africa’s biggest and most prestigious game reserves. And elephant management has always been one of my very special interests. I am a university-trained ecologist. And, in this regard, I know what I am talking about. Today (2018), there are 20 times too many elephants in Botswana’s northern game reserves; 20 times too many in Zimbabwe’s Hwange National Park; 12-14 times too many in Zimbabwe’s Gonarezhou National Park; and 10 times too many in South Africa’s Kruger National Park. So, no matter what anybody may say about elephant numbers in the rest of Africa, when the major game reserves of southern Africa have many tens-of-thousands of elephants too many – well-over 100 thousand too many – how can the elephant, as a species, possibly be facing extinction? I say again, therefore, that the story the international animal rights community put out in their continuous propaganda campaigns during the three years prior to CoP17 – that the African elephant was facing extinction – was a purposely fabricated lie. The fact that it was a lie didn’t worry these NGOs because the story had such an emotional appeal that the gullible publics of the world never stopped digging evermore deeply into their pockets to find enough money to ‘save the African elephant’. It didn’t worry them one iota for another reason: because nobody has ever challenged the validity of their continuous propaganda fabrications. When a person tells a lie, then makes money out of that lie, that action constitutes ‘common fraud’. When he commits that fraud a second time, legally it becomes a ‘racket’ – and we know, for sure, that the lie about the elephant facing extinction was repeated in a variety of animal rights propaganda outlets many hundreds of thousands of times throughout the three years running up to CoP17. And there is more! According to the American Racketeering Influenced and Corrupt Organisations (RICO) Act – which is recognised in South Africa – racketeering is on the list of 35 other crimes which legally constitute ‘organised crime’ in America. And this very high level of organised crime has been going on right under our noses in South Africa for the last three decades; millions of US dollars have been made through these propaganda rackets overseas; and nothing has ever been done about it. May I suggest, therefore, that the South African Parliament now take this matter to heart in a more serious fashion than has hithertofore been the case! Finally, the international animal rights groups that affiliate with our southern African animal rightist NGOs, make very little money out of disseminating their propaganda in southern Africa; but they need the fabricated wildlife stories to continue to come out of southern Africa to stir the emotions of their own huge, uninformed and very gullible publics in the Western developed-world back home. It is in the West where they make their money. 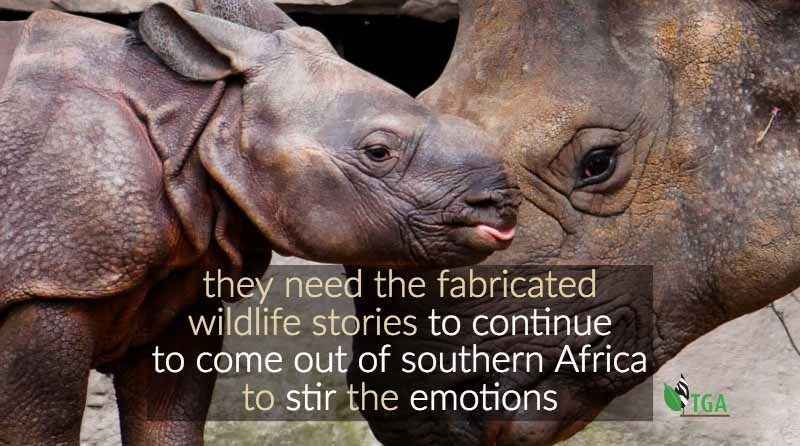 It pays them, whatever it costs, therefore, to keep the emotional wildlife pots boiling in southern Africa, because it is from the spreading of those propaganda stories in the West that they make their millions. The story about ‘Cecil the Lion’ paid the animal rightist NGOs in America, the European Union, and in England, an absolute fortune in solicited donations. They even had a large bronze statue of Cecil erected in Washington DC – in memory of Africa’s most famous lion. And the story of Skye – ostensibly being shot ‘illegally’ in the APNR in the same manner that Cecil met his Nemesis – was designed to resurrect all the emotions and the hype that Cecil had once stirred the hearts of the animal rightists’ supporters in the First World. And it was great fun for them to embroil – and to dupe – the susceptible members of the South African Parliament in the process. The way the Portfolio Committee on Environmental Affairs has been drawn into considering revising the agreement between Kruger National Park and the APNR, shows how smoothly and easily the animal rightists can inveigle their way into the affairs of government in order to further the animal rights agenda in South Africa. South Africa’s own animal rightists – egged on by their American and Dutch animal rightist friends – have already caused havoc in our Department of Tourism; ostracising our hunters from the tourism market place; splitting our Professional Hunting Industry; and persuading incoming visitors to sign petitions stating that they refuse to be taken to game lodges where hunting and/or culling of wild animals also takes place. In my opinion, South Africa’s animal rightists have already ‘captured’ our Tourism Department and they have started to influence policy decisions concerning tourism to this country (with a lot of help from the Humane Society of the United States and animal rightists in Holland).